Over six years and three hundred issues (and counting), Model D Media has documented what’s next for Detroit, from big development and investment, to small ideas and innovation. Add up the thousands of stories told every Tuesday in vivid words and images, and it becomes very clear: The next big thing is not any one thing. It’s a multitude of people and projects transforming our city – one lot, one block, one story at a time. 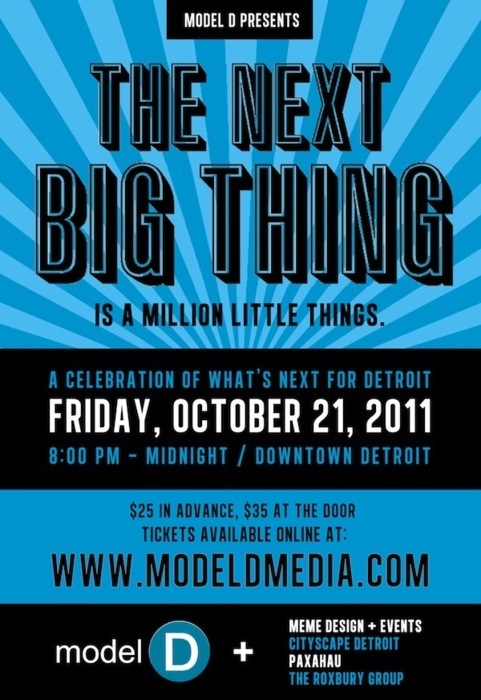 To celebrate the big power of small ideas, Model D proudly presents a first-ever showcase of what’s next for Detroit. On Friday, October 21st, 2011, in the majestic rotunda of the historic David Whitney Building in downtown Detroit, Model D will bring together local art, music, food, culture and entrepreneurship for a tribute to the creative spirit alive and well in our city. “The Next Big Thing” will bring Model D’s weekly e-magazine to life. The event will take place from 8:00 p.m. to midnight at 1553 Woodward Avenue. The main entrance is on Park Avenue between Woodward and Washington Boulevard. Tickets are $25 in advance, $35 at the door. Advance tickets can be purchased online at www.modeldmedia.com through October 20. Hatch-Off -- From July 1 to September 1, 2011, Hatch Detroit collected the best ideas for a storefront retail business to open in Detroit. At “The Next Big Thing,” the Final Four contestants will compete for the first time in an intense Q&A session in front of three of the most creative business minds in Michigan – Torya Blanchard, Good Girls Go to Paris; Paul Saginaw, Zingerman’s; and David Blaskiewicz of the Downtown Detroit Partnership. Be there to witness it live and cast your vote for the winner, who will receive $50,000 and over $25,000 in services to "hatch" their business. Exposition -- Dozens of creative civic projects will share their work in a visual showcase curated by Detroit SOUP. Exhibitors include: BME Challenge, Declare Detroit, Detroit Big F Deal, Detroit City Futbol League, Detroit Creative Corridor Center, Detroit Lives, Friends of Cass Park, Green Garage, Homeslice, Kiva Detroit, Let’s Save Michigan, Marche du Nain Rouge, Open City, PonyRide, Power House Productions, Public Pool, Recycle Here, Revitalization & Business, Rogue HAA, Signal-Return and Tour de Troit. Pure Detroit -- The original Pure Detroit store opened in the David Whitney Building on Thanksgiving Day in 1998. Since then, owners Shawn Santo and Kevin Borsay have gone on to open three retail locations in the Fisher Building, the Guardian Building and the Renaissance Center. For Model D's event, Pure Detroit will share some favorite offerings from their local culture shop. Local Food, Music & Art – Guests will experience the sights, sounds and tastes of the city as the rotunda comes alive with local food, music, photography, video and more. Featuring: Future Jazz Kartel, Happy Endings, One Single Rose, Marvin Shaouni, Dave Krieger, Detronik, Hygienic Dress League, Rogue HAA and Street Culture Mash. “The Next Big Thing” is presented by Model D Media with support from Knight Foundation, Quicken Loans, Urban Science, Honigman, The Roxbury Group and Trans Inns Management. Supporting sponsors include Invest Detroit, Detroit Economic Growth Corporation, RAM Construction, SME, SES, Walbridge, Young Supply, Kraemer Design Group and Gyro. The event is produced by MeMe Design + Events and Paxahau in collaboration with Cityscape Detroit.